I’ve been a fan of the movies of Powell and Pressburger since watching A Matter of Life and Death in a film studies class in high school. 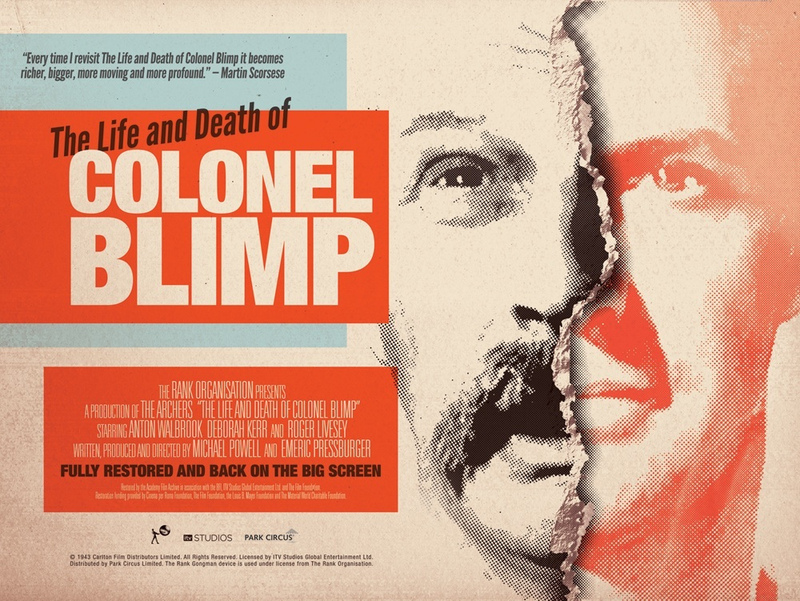 Last weekend I went to the National Film Theatre in London to re-watch another of my favourite movies of theirs, The Life and Death of Colonel Blimp (1943), which has recently been restored and re-released. Martin Scorsese – another of my favourite directors – is a big fan of the film and says it becomes “more resonant, more moving, more profound” every time he watches it. For Scorsese, the film is about time, memory and loss. According to the BFI, it’s also “probably the greatest study of ‘Englishness’ in the cinema”. But, as I watched it again last weekend, I found myself wondering whether it’s also about Powell and Pressburger themselves. The character of Colonel Blimp was created by the cartoonist David Low in the 1930s. An old duffer usually depicted talking pompous nonsense in a Turkish bath (hence the scene of the film in which we are introduced to the Blimp character in a bathing club), he became the embodiment of a British military that was seen as increasingly old-fashioned. For example, Orwell often wrote about “unblimping” – in other words modernising – the British military. Churchill famously wanted to stop Powell and Pressburger from making a film based on the character: his friend, Minister of Information Brendan Bracken (later the founder of the Financial Times), met with Powell and Pressburger before production began and told them that the “the old boy doesn’t like it” but did not stop them making the film. Powell and Pressburger went ahead, but instead of ridiculing the British military as Churchill presumably thought they intended to, they actually made the cartoon character sympathetic while also suggesting the British military had to change and had changed. One of the things that make Powell and Pressburger’s films so interesting is their complex attitude to Englishness. According to the programme notes for Blimp, Powell and Pressburger’s work involves “such an inextricable criss-cross of un-, anti- and ultra-Englishness … that it is hard to decide whether they are insiders trying to cut their way out of hidebound traditions or outsiders trying to revitalise those traditions.” Presumably, part of that ambivalence is the product of the tension between Powell and Pressburger: one an Englishman; the other a Hungarian Jew who worked in Berlin but was forced to leave after the Nazis came to power and moved to Britain in 1935. The distinctive ambivalence towards Englishness in their films – in particular the way they seem simultaneously to criticise and romanticise Englishness – is presumably a function of these two very different perspectives. What occurred to me when I watched Blimp again the other evening was how the two characters on whose friendship the film centres – the British officer Clive Candy and the German officer Theodor Kretschmar-Schuldorff – channel these two perspectives. Thelma Schoonmaker, Powell’s wife (and Scorsese’s editor), says in an interesting BBC radio programme that Roger Livesey, who plays Candy, was Powell’s alter ego. Kretschmar-Schuldorff, on the other hand, seems to contain elements of Pressburger, who, like him, came to Britain as an exile from continental Europe. One seems to hear Pressburger above all in Kretschmar-Schuldorff’s famous speech about England to an immigration officer (a speech that, as Ian Jack points out, has also been echoed by Ed Miliband). So perhaps the friendship between the two characters in Blimp actually stands for that between Powell and Pressburger. This entry was posted in Britain, film. Bookmark the permalink.